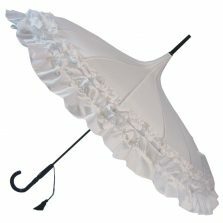 The LuLu frilly white umbrella, though a perfectly proper ladies rain umbrella also makes for a stunning ladies fashion parasol. What finer choice of umbrella on a Summer’s day at that special outdoor event. Scroll down for more info. The LuLu is suitable for weddings, garden parties, a fete, a day at the races, a picnic. The LuLu is a sumptuous deep, triple frilled white umbrella. 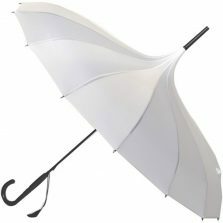 A frilly white umbrella which is fully automatic opening and comes with a black metal frame and eight strong, light yet strong and flexible fibreglass ribs. This slightly burlesque pure white parasol also features a striking and contrasting black leather effect crook handle and tassel. Rounded metal spoke tips. Elegant top with metal ferrule. 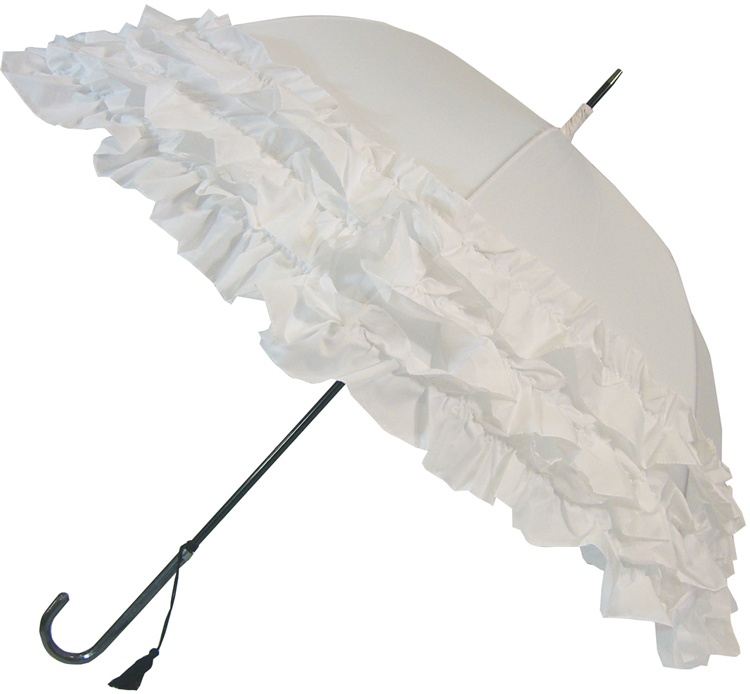 These pretty white frilly umbrellas are perfect for all classy occasions and venues. Also suitable for every day use. 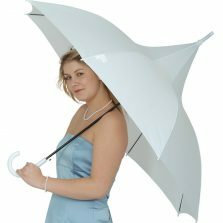 Made from a totally rainproof fabric, they are equally effective as a wonderful white sunshade and as a perfectly proper rain umbrella. Length is 90 cm and the huge canopy is 98 cm wide. 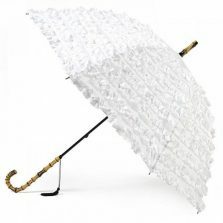 So if you’re looking for a fabulously frilly white umbrella LuLu – it’s for you! Not the umbrella for you? Click to check out the rest of our range of quality wedding umbrellas!